Keith Shaw is Programming Director at Network World, responsible for multimedia strategy. In addition, he writes the Cool Tools column, which looks at personal technology and other fun stuff. In the Shaw household, we’ve been living without cable TV for about seven months. We’re now officially “cord cutters”, saving about $60 per month and getting our “TV” through Internet streaming services (mainly Netflix, Hulu and Amazon Prime video). This article isn’t about that effort (although I would recommend it if you can live without watching live TV events). A result of the cord-cutting has left me with a bunch of rooms with coaxial cables that now have nothing to do. 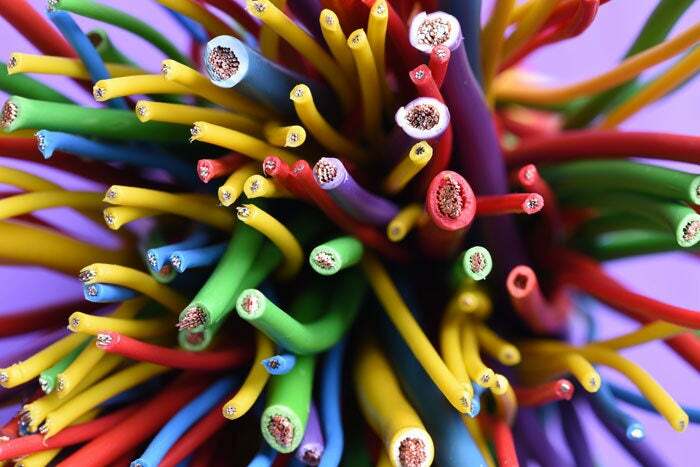 I started to think – why not use those cables to provide data networking access? After a quick phone call with a member of the Multimedia over Coax Alliance (MoCA), I received some products that use MoCA to provide network access via coaxial cable. From the end user’s standpoint, networking via coax works similarly to powerline networking – data traffic is delivered through coaxial cables in the house. In this way, MoCA can be used as a network option instead of using a wireless range extender or investing in a wireless mesh network. The MoCA gear can fill in the gaps for wireless holes, mainly because coaxial cable is likely already dropped in that room of the house (if you live in a house that had several rooms with TVs in them). Chances are good that your modem/router is already MoCA-enabled (in my case, the Verizon FiOS model was). If not, you can use adapters to create the network. 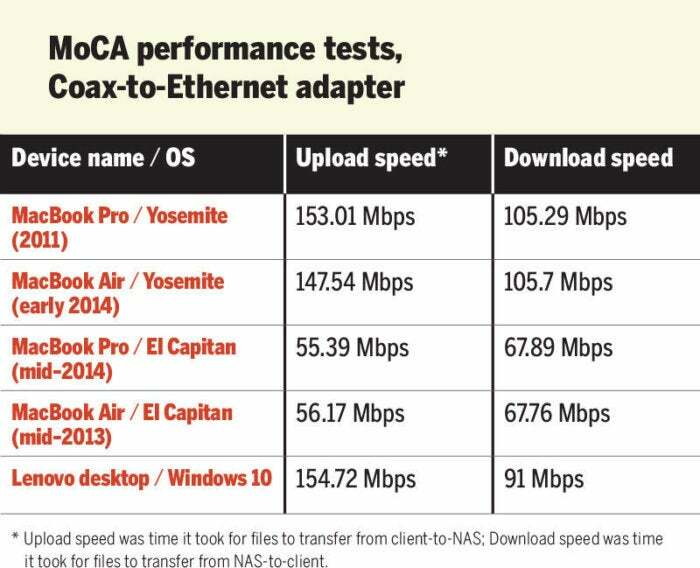 MoCA throughputs range from 100Mbps at the low end (MoCA version 1.0) all the way up to 2.5 Gbps (MoCA 2.5), with several versions in between. The gear sent to me supported MoCA 2.0, which provides up to 500 Mbps of throughput. However, the Verizon modem/router I was using only supported version 1.1, which downgraded the max throughput to 175 Mbps. Since I wasn’t going to call Verizon to ask for an upgrade, I couldn’t fully test the 2.0 gear to see how fast it really was. As part of the request from MoCA, I was sent some Actiontec coax-to-Ethernet adapters and a coax-to-Wi-Fi range extender. The Ethernet adapters let you connect one end to a coaxial cable, with an Ethernet port on the other end. If you have a client with an Ethernet port (some game consoles, older notebooks, desktop systems), the adapter lets you put that device on your MoCA network. The Wi-Fi range extender connects to the coaxial cable network and then provides Wi-Fi coverage (via a 2.4GHz and 5GHz channel). This would be recommended for clients that don’t have an Ethernet port, such as newer notebooks, smartphones and tablets. Connecting these devices to my coaxial cables wasn’t difficult – it’s pretty straightforward where you need to plug in each cable, and as long as you have a power outlet available for the adapter or extender, you should be up and running in no time. There’s even an extra coax cable on the Ethernet adapter in case you want to also provide coaxial support for a TV or cable box, in case you haven’t yet cut the cord. Performance of the gear wasn’t stellar, but it wasn’t horrible either. 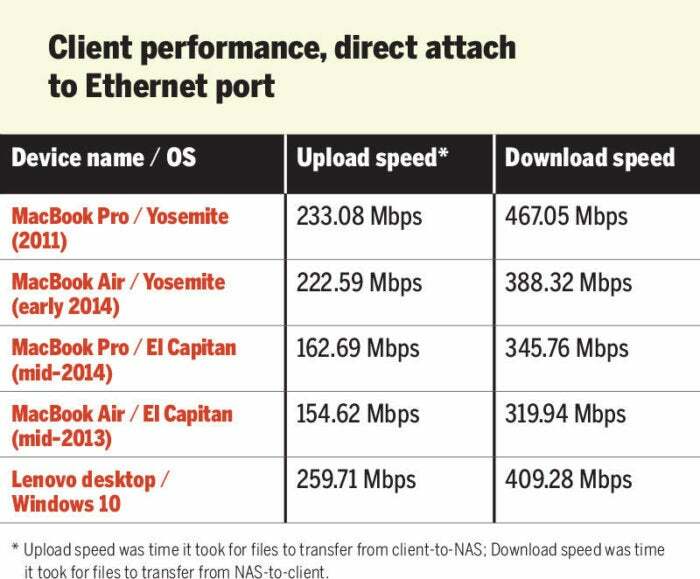 Depending on the client used, I achieved somewhat good throughput numbers in my “unscientific” file transfer tests (measuring upload and download times via file transfers to a network-attached storage device connected to the modem/router). I’m sure that performance would have improved if I was using a newer modem/router from Verizon, but that would require additional investment and upgrading my home data broadband package. 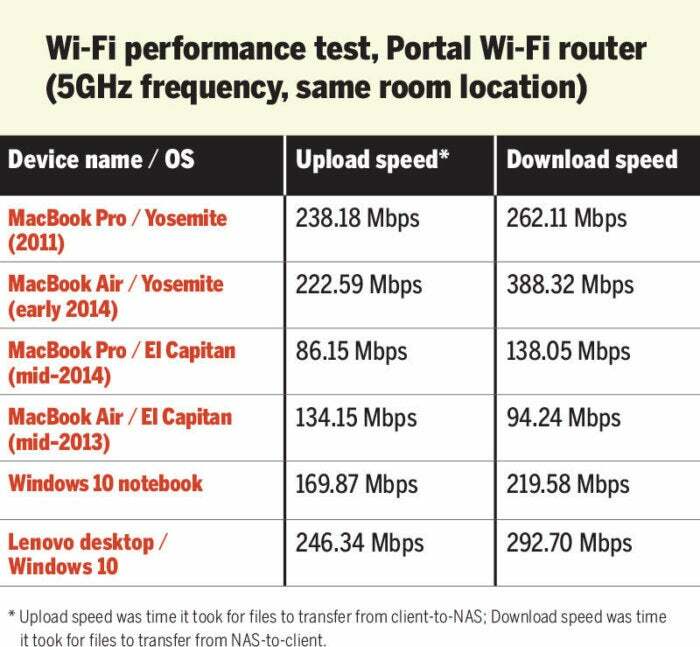 Using the Wi-Fi extender combined with the MoCA backhaul also caused wild variations in speeds – sometimes a data transfer would fly, other times it would crawl. I also discovered that using a Mac notebook with the El Capitan OS greatly reduced my data transfer times, compared with using older equipment with Yosemite, or using Windows 10 systems. 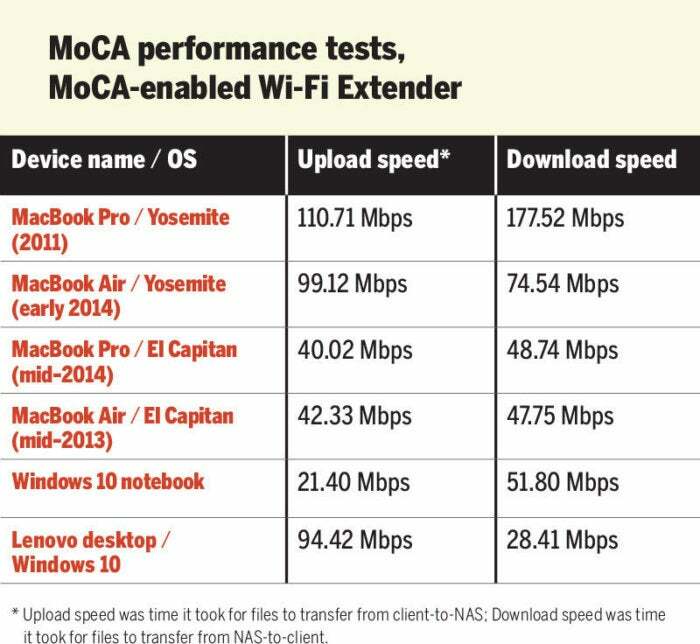 In addition, MoCA might not be the best option when considering a Wi-Fi system that’s in the same room. For rooms where Internet access is needed that is far away from your router, MoCA begins to make more sense because of the distance limitation of Wi-Fi. The biggest issue with MoCA is that most end users likely don’t know that it exists or where they can buy the equipment. Actiontec, for example, works with service providers like Verizon and other broadband carriers, who would then install it for their customers. In my case with Verizon, I didn’t even realize I had MoCA enabled on my router until I connected my first adapter and the router assigned the adapter an IP address. The service providers don’t seem to be overly motivated to try and explain this to their customers -- maybe they will now that the wireless mesh and “whole home coverage” market is growing. Trying to find MoCA in the retail space can also be challenging. Try walking into a Best Buy and asking someone “Do you sell MoCA?” and see if they’re thinking that you’re asking for a cup of coffee. Fortunately, you can find MoCA gear online through Amazon and other sites, but again, you have to go looking for it – it’s not going to be found easily. In the end, deciding whether to go with MoCA or not will depend on your own home situation, whether you have coaxial cable and wireless coverage holes, and whether you would need to upgrade existing modem/router equipment. For new homes or service upgrades (like if you’re switching to a new carrier), asking about MoCA can solve a lot of those issues before they become problems. I don’t think MoCA is going to derail the wireless mesh or whole-home coverage movement, but it does provide an option for those who might not be helped by wireless gear.